At this time of year, hazel trees are dropping their ripe brown nuts. Many will be eaten by small mammals such as squirrels and mice, and the kernels, which are packed with protein, will help them to survive the winter. Almost every cool zone has a hazel to call its own: there is the Siberian hazel, the Himalayan hazel, the American hazel and the Turkish hazel -- which has very fancy "turbans" on its nuts, and grows up to 20 meters tall, making it a giant among the species. Japan has several types of hazels, including the tsuno hashibami, meaning "horned hazel," which completely wraps its small nuts in long husks shaped like a horn. However, the parent of many farmed nut trees is the common wild hazel of Britain, Corylus avellana, a sprig of which is pictured above. This modest shrub has long been credited with magical powers. Hazel twigs are both strong and pliable, and as well as being used for making baskets and fences, they were used as magical wands by druids and witches. "Dousers" -- those people with a gift for finding hidden springs -- still use hazel twigs to detect the presence of water underground. As for the nuts, the Celts believed they were a source of great wisdom, and they are probably the origin of the English phrase "in a nutshell," meaning a brief explanation that is packed with knowledge. 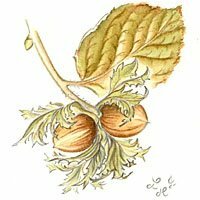 The Hazel used to be the only proper edible Nut tree on the British Isles, and this gave it a special place in folklore and tradition. The hazel might be regarded as the quintessential Celtic tree because of its legendary position at the heart of the Otherworld, where nine magic hazel-trees hang over the well of Wisdom and drop their purple nuts into the water. Hazel represented the letter 'Coll', which was the ninth letter of the Irish Bardic Ogham alphabet. It gave its name to a God named Mac Coll (son of Hazel), who according to Keating's history of Ireland was one of the earliest rulers of Ireland. Hazel was also used widely throughout the centuries for protection against evil. Until quite recently young lovers roasted hazel-nuts over fires at Halloween, which was also known as "Nut-crack Night." In Celtic myphology, those that eat the nuts (or the salmon) gain poetic and mantic powers. Many early Irish tales describe poets and seers as "gaining nuts of Wisdom". Before the second World War, it was still quite common for the Irish to harvest the nuts. Timing was very important. Too early and the nuts will lack taste and will not store long. Too late and the jays and squirrels will have all. People would take picnics and a drink of ale or cider. 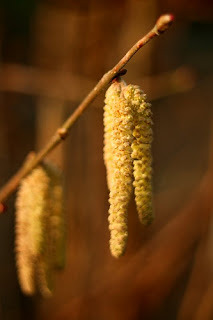 The long male Hazel Catkins are sometimes called 'lambs tails' The female catkins are small and reddish on the same branch. Hazel is an accomplished writer of haiku.